Dr. Rajasekhar, the versatile actor who acquired the image of an angry young man through such films as 'Ankusham', 'Magadu' and 'Aagraham', is one of the most loved all-round actors in the history of Telugu cinema. 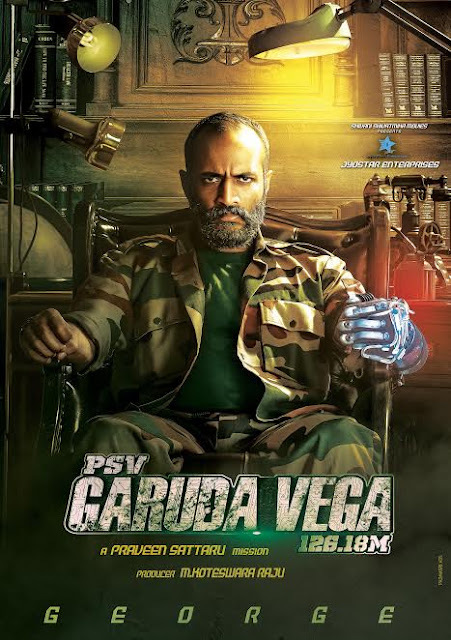 His action entertainer with director Praveen Sattaru is titled 'PSV Garuda Vega 126.18M'. The film is produced by M Koteswara Raju on Jyostar Enterprises and presented by Shivani Shivathmika Movies. After roping in Sunny Leone for a special song, the makers have revealed something interesting about Kishore's character in the movie. Named George, he is evil-personified in this stylish entertainer. Devious, deceptive and deadly, George is physically imperfect, but mentally sharp. None can outsmart him, come what may. He can’t be reasoned with and sure as hell, he can’t be threatened with anything. A perfect kill machine with no empathy, an avaricious predator and, finally, the ultimate, unapologetic villain. Kishore has earlier played defining characters in such films as 'Kabali' and 'Cheekati Rajyam'. In 'Garuda Vega', his character will be on a par with that of greatest on-screen villains like Mr. India's Mogambo and Sholay's Gabbar Singh. Moreover, the director of the critically-acclaimed 'Chandamama Kathalu' and the adult comedy 'Guntur Talkies' is out to unveil a stylish and suave Rajasekhar in this flick. Pooja Kumar is the female lead. Sunny Leone, Arun Adith, Shraddha Das, Ali, Nasser, Prudhvi, Ravi Varma, Charan Deep, Sayaji Shinde, Posani Krishna Murali and others are part of the cast. Music is by Sri Charan. Cinematography is by Anji. Art direction is by Srikanth. It's produced by Koteswara Raju.